The Tibetan Buddhist center Phuntsok Chö Ling in Rotterdam is organizing its Autumn retreat from 19 October 2018 (19:30) to 26 October 2018 (17:00). 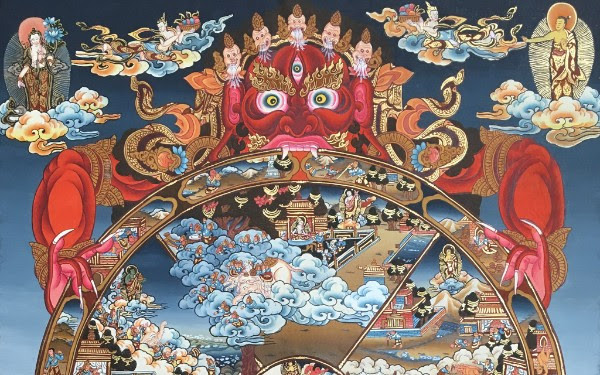 Lama Jigmé Namgyal will explain the bardos of life and dying during a seven day city retreat. Bardo is a Tibetan word that simply means ‘transition’ or ‘intermediate state’. A gap between the completion of one situation and the onset of another. In the Buddhist approach, life and death are seen as one whole, where death is the beginning of another chapter of life. Death is like a mirror in which the entire meaning of life is reflected. This view is central to the most ancient school of Tibetan Buddhism. The word bardo is commonly used to denote the intermediate state between death and rebirth. In reality, bardos are occurring continuously throughout both life and death. They are seen as unique moments whereby the possibility of liberation or enlightenment is heightened. During this profound retreat Lama Jigmé will dive into being more aware and accepting of impermanence. This can help in everyday life to deal with loss and setbacks easier and eventually lead to less (or no) fear during the transition to the bardo of death. For questions or comments, please contact: events@phuntsokcholing.org. NOTE: This year, an early booking discount applies to registration before September 7, 2018, so sign up right away!